Adults and older teens prefer to look mature, professional, and sophisticated. Straightening teeth with bulky, metal braces isn’t an option if you want to maintain your appearance. Dr. Alan R. DeAngelo understands the need to keep orthodontia hidden, so he offers Invisalign clear braces for a stealthy smile solution! Call our Homer Glen office today to schedule an appointment to learn if Invisalign is the choice for you. Instead of relying on bulky metallic braces for your orthodontic treatment, ask Homer Glen dentist Dr. DeAngelo about Invisalign! This innovative system of clear, removable orthodontia is custom-made for each patient with the assistance of 3D imaging by iTero and computer-aided design. 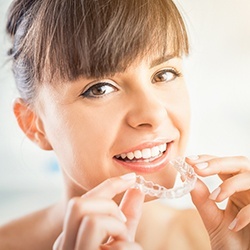 As a certified Invisalign dentist in Homer Glen, Dr. DeAngelo can create your treatment plan and work with a trusted lab for the creation of your Invisalign series. An Invisalign tray is made of strong clear plastic, which makes it nearly completely invisible! 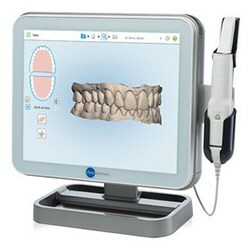 You’ll be able to actively improve your overall oral health with this orthodontic system without sacrificing your image. This technique has been proven to correct alignment problems like overbites, underbites, crossbites, and even for general crookedness. Dr. DeAngelo will go over your goals and discuss what you hope to achieve with this therapy during your initial appointment at our Homer Glen office, and work with you to help meet each of your realistic cosmetic dentistry goals! All you have to do is wear your clear aligner for a few weeks, come in for an assessment, and move to the next aligner in your series. Usually, a full treatment session takes six to 18 months. Gradually, you’ll be sporting a winning, healthy smile. You can remove the Invisalign aligner for special occasions, when cleaning your teeth, and when eating a meal.